This is a Kitani joseki from the 1940s - though not exclusive to him. Black aims to make a very solid stone. Up to is standard. In this case leaves no weakness behind (compare with the case of at a). This is a tight way to play. Unusually Black can also play inside, as here. 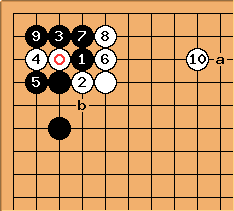 In this main line, played in 2001 in a number of pro games, Black takes a larger corner but White is thicker. xela: On general principles (ExtensionFromAWall) wouldn't normally be at a? I found four pro games with this variation; two out of four had at a. How would one choose? For at b, see BQM186. antic: Okay, but what if black plays like this? I played a in a game and got a very unsatisfactory result. Bill: White would hate it if Black played atari at , so looks like a good play. It's a double attack, threatening and as well as . Bob McGuigan: The shape in this diagram is crosscut-like and in such a situation it is always useful to ask which of your crosscut stones needs the most help. 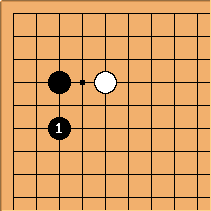 It seems the white stone on the 3-3 point needs help, so extend its liberties, as does. 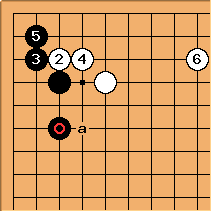 Bill: Although the early play is different, in Kono Te Goyoshin (Watch out for these plays), 4-4 vol., Go Seigen shows this diagram and says that it is good for White. White aims at a or b. Bill: It may be best to atari with first to get Black to invest a stone with . After something has to give.